Bring the Space theme to vivid life by transforming the venue into a space craft, on a virtual, intergalactic journey to a distant planet, to be colonized by the Cruise Automation team. 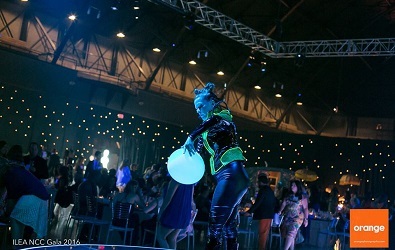 This immersive, multimedia experience features custom, futuristic environments on all 3 floors of the venue, interactive sci-fi characters, alien close-up magic, leading-edge dance performances and audience participation, for an out-of-this-stratosphere experience. The pioneering Cruise Automation team will board Cruise One for an intergalactic journey of discovery to their new home world, Alter Domi - the first colony of its kind. Upon arrival, guests hear an ambient, space soundtrack and the soothing feminine voice of the vessel’s Al greeting them. "Welcome to Cruise One. Please proceed to the Main Deck. A crew member will prepare you for takeoff." Guests are then greeted by the vessel’s 5 crew members (the entertainers), a diverse mix of humans and aliens, who act as the team’s guides. Once guests are all aboard, they will experience the excitement of a countdown to blast-off. The countdown from 10 is displayed on the big screen on the Main Deck and everyone joins in. At 0, the sound of the rocket ship blasting-off fills the room, along with rumbling sound effects. *Recommendation: Lights flicker on and off to signify blast-off, and the large screen displays a rocket ship launching. The DJ plays directly after take-off. Displays on the video screen and lighting design is provided by the venue. We will coordinate and manage the delivery of these elements from the other vendors. Main Deck (Ground Floor): Bright white lighting and stars falling downward slowly on the large screen (to illustrate space craft motion). DJ is playing and guests are dancing, dining and experiencing alien, close-up magic. *Recommendation: White couches and cocktail tables and chairs. We also recommend an Oxygen Bar as an added attraction. Engine Room (Lower Floor): Dim red lighting and ambient mechanical sound track. The voice of the space craft's AI can be heard assessing functions: "Oxygen levels are normal... Coordinates, entered." Cultural Assimilation Room (Upper Floor): Green lighting and ambient space sound track plays. Room is filled with artifacts such as sepia photos, rocks and plants from the planet Altera Domi. Guests interact with aliens from this planet to learn of their culture. The Altera Domians mesmerize guests with other-worldly performances featuring glow spheres, ethereal music and magic, every 45 minutes. *Recommendation: Green couches, a round stage and theatre seating. For the exhilarating, multi-media conclusion, guests are invited to participate in a final countdown. Once the space craft reaches the stargate, it makes a heart-pounding leap through a worm hole to Altera Domi, the final destination. Guests watch this momentous event on the Main Deck's big screen. In celebration of this scientific feat, the cast launches into a high-energy, futuristic dance performance, infused with magic, for a satisfying and electrifying finale. *This would be a perfect point in the program for Kyle Vogt to say a few words if this is on the agenda. *The venue provides the video footage on the big screen. We will work with them to make this deliverable. We provide the sound effects. All featured items in Package 1 with the addition of a show-stopping musical and magical performance titled Quantum Leap, featuring all five cast members; choreographed to an original, orchestrated score with dazzling magic, spectacle and surprises on the Main Deck for the big finale - the Space Jump.